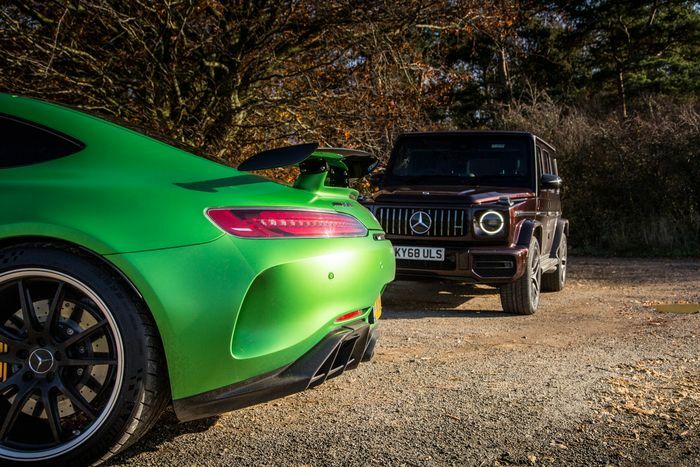 No two cars better reflect the sheer breadth of what AMG offers than these two cars, but which is the most exciting? As a human, your DNA shares a 60 per cent similarity with a banana. This - and the fact we also share 90 per cent of our DNA with cats - is because all life can be traced back billions of years to the same ancestor, thought to be a ‘primordial ooze’. So, we effectively have the same parent as bananas, we’re made of much of the same stuff, and yet, we’re entirely different. 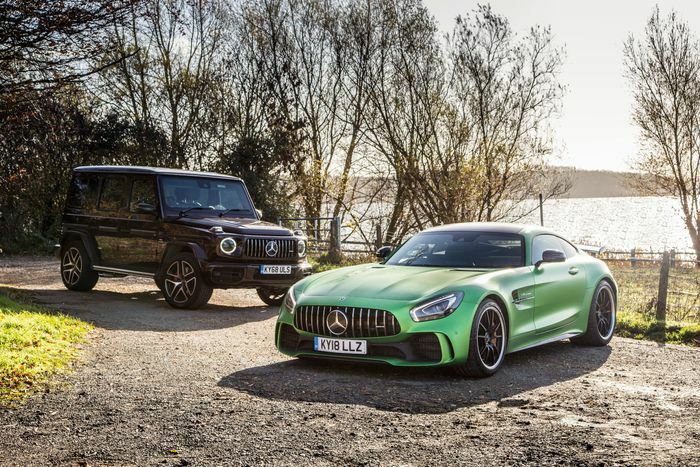 Rather like the Mercedes-AMG GTR and G63 you see here. And yes, it has occurred to me this tortured analogy would have worked better if one of them was yellow. 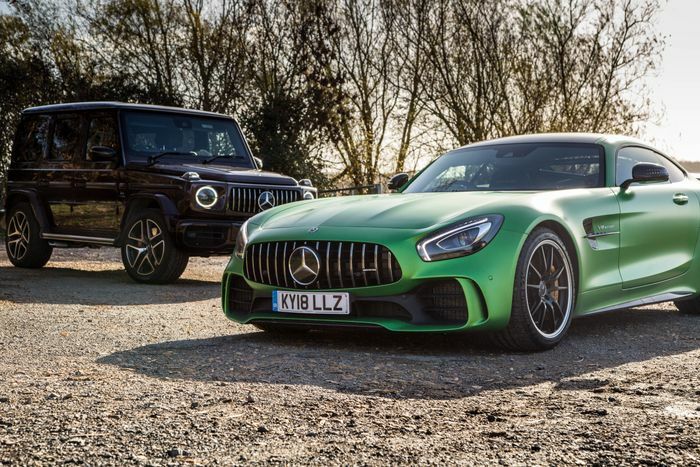 They’re both expensive, they’re both powerful, and they’re both utterly bonkers, but in very different ways. Being from one sub-brand and even using derivatives of the same engine, they’re very much cut from the same cloth, but looking at them, you certainly wouldn’t know it. 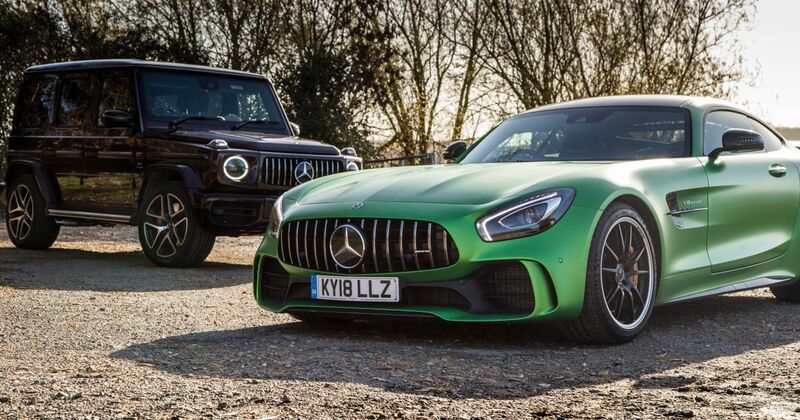 No two cars better reflect the breadth of what AMG can offer than these two lunatics. Both cars garner more stares and double-takes than pretty much anything else I’ve driven this year, but the expressions each car receives are rather different. People eyeball the GTR with a face of appreciation, joy and jealousy. With the G63, it’s more a look of bemusement and hilarity at the sheer presence of this box on wheels, this 1:1 scale Tonka toy trundling along with a vocal, burbly soundtrack. I’m not at all ashamed to admit that the old G63 scared the bejesus out of me. 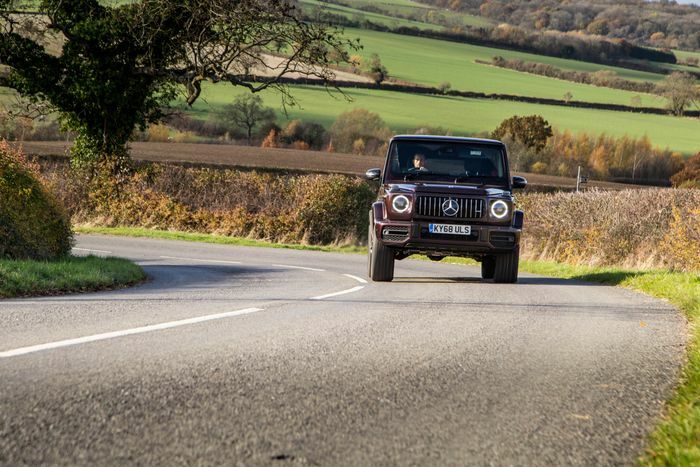 Our usual shoot driver Jon Benson - who’s been testing cars for well over a decade - still reckons the Colour Edition G63 we had in earlier this year is the most terrifying thing he’s ever driven. The combination of a solid front axle and recirculating ball steering made that car rather alarming to drive at speed. You’d find yourself hacking away at the steering wheel just to keep the thing in a straight line under power. Every little imperfection, each slight camber change in the road - it all plays havoc with the old G’s wayward front end. Its simple, sturdy platform was never intended to deal with the fury of a 544bhp twin-turbo V8. Worryingly, this new one has more power. In fact with 577bhp, it’s packing the exact same heat as the GTR. Gulp. It only takes a few turns of the wheel, though, to determine that the new one is a very different animal. Thanks to a switch to independent front suspension (there’s still a sturdy solid axle at the rear) and rack and pinion steering, you actually have some clue as to what’s going on at the front. You’re no longer constantly sawing at the wheel just to keep the car pointing vaguely in the right direction. There’s still a hilarious amount of lean going on in the corners, but this 2.5-tonne hulk feels much more contained than its predecessor. It’s just a shame that no one told the stability control system: even in the slacker ESP Sport mode, it doesn’t take much at all to trigger an over-zealous intervention. Power is cut completely and it even feels like a little bit of brake is being applied on a front corner. 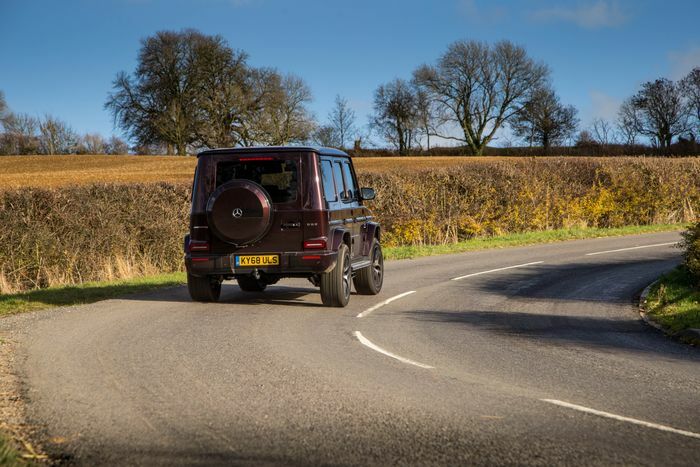 I get that a high-riding, over-powered heavyweight needs a safety net, but this one cuts in far too early: the G63 is surprisingly capable in terms of traction and grip. The electronics are at least happy to let you reach the end of that ability from time to time, at which point the front end will inevitably start to push on. Rather like the old car - it’s just that this point is much further away, and when it does go, you don’t get the feeling you’re about to understeer into the next county. Acceleration remains just as hilarious, with the car dramatically squatting at the back with each full throttle application, making you wonder just for a brief moment if this car needs a wheelie bar. 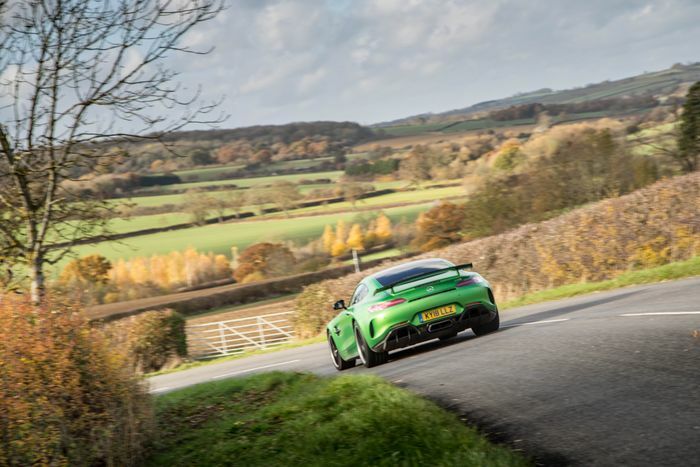 0-62mph takes 4.5 seconds, and even though it has the aerodynamic properties of a detached two-storey house, it will - with the AMG drivers’ package - top out at 149mph. Even though this feels far less unnerving to drive than the old one, I’d really rather not try that speed myself. The soundtrack isn’t quite what I expected. From the outside, there’s a lovely ‘woofle’ to the V8 exhaust note, but on the inside, you’re treated to a brassy, excitable crescendo. 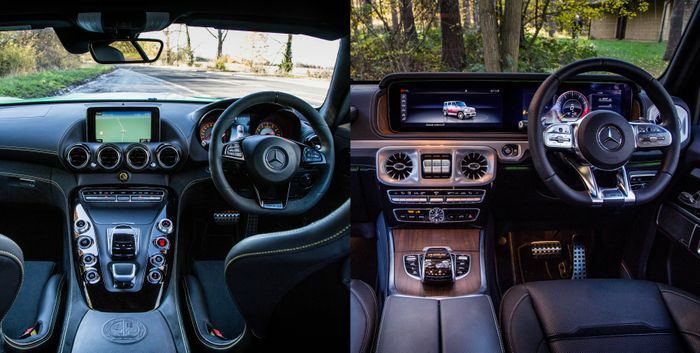 A little like what you get while in the cabin of an E63, which has this same, newer version of Merc’s 4.0 litre. Is there a resonator hiding behind the dash, or some other kind of enhancement going on, I wonder? 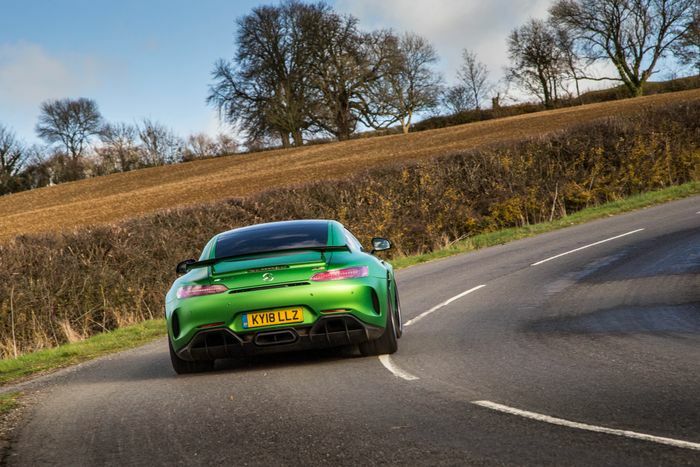 Dropping behind the wheel of the AMG GTR - and that really is the only way to fit yourself in its deep carbonfibre bucket seats - I’m presented by an interior that feels surprisingly dated compared to the tech-infused cabin of the G63. There’s no fancy twin-screen setup here - we get the older nav system which Merc is in the process of replacing across its range, and curious details like a teeny-tiny gear selector and gasps physical dials. 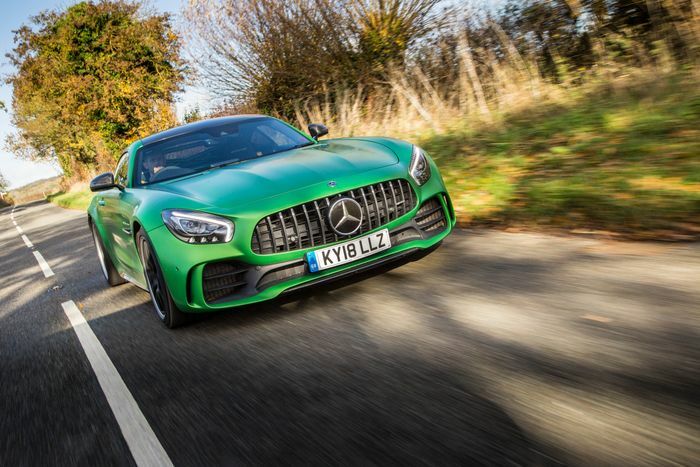 Fire extinguisher and green - yes, green - half cage aside, there’s not a whole lot in here to tell it apart from any other AMG GT. But as with the G63, the GTR shows its hand very quickly - it doesn’t take long to discover exactly the difference that ‘R’ in the name makes. I’ve driven a GTR on track before, but that was at Bilsterberg, where it’s easy to get distracted by the sphincter-tightening proximity of all its concrete barriers and the prospect of turning a £150k car into a sharp-edged aluminium and carbonfibre jigsaw puzzle. Out here on the road, I have more time to appreciate just how engaging it is, particularly through the hyper-communicative steering. When you drive a Porsche 911 GT3 RS away from the track, every imperfection and camber change in the road makes itself known through aggressive kickback, and it’s much the same here. It’s an angry, uncompromising car on the whole. That lively steering is also very heavy. The cabin never quiet. The ride incredibly firm. On some surfaces, the latter attribute can make the GTR feel sketchy and nervous, but that doesn’t detract from a chassis that can be mentioned in the same breath as that of the aforementioned GT3 RS. Yep, it’s that good. 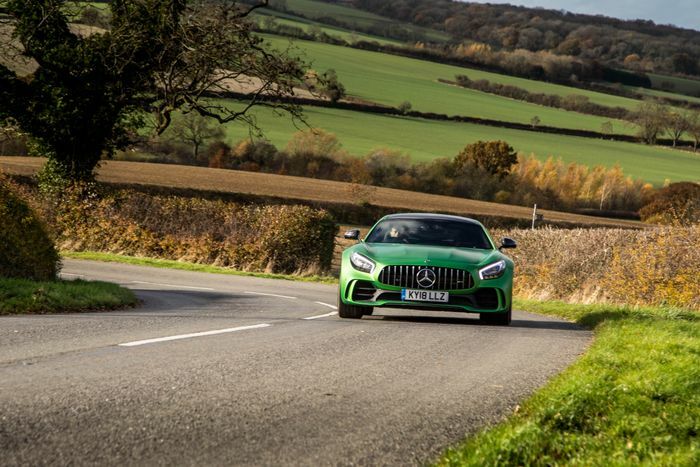 The front end continually astonishes as you neatly tuck it in to bend after bend without a hint of understeer, and while those Michelin Pilot Sport Cup 2s - measuring in at a fat 325mm at the rear - do struggle on a cold, damp day, the road is now dry. And boy, are they holding on. Even when you run out of traction at the rear, as was happening earlier today, it’s not an issue. Unlike the less sophisticated electronic aids in the G63, which feel the need to shut the party down like an angry parent returning home to find a bunch of drunk people chugging from red plastic cups, the GTR’s traction and stability control systems merely turn the volume down a tad. In Sport+ those rear boots will happily slip and the back end will squirm if the demands of your right foot are out of kilter with the state of the road under you. On a dry track, it’s easy enough to switch into race mode and turn everything off, at which point the dial in the middle of the dash - which lets you decide exactly how off ‘off’ is - comes into play. That’s for another day. The G63 may have the shock factor of its eager pickup, but being so high up, the impression of speed quickly dissipates. Not so in the GTR, where you’re sat with your arse inches from the ground in a lighter, punchier vehicle. Good lord does this thing have some mid-range clout, scrambling your insides and pinning you to the back of your seat with the merest tickle of the throttle. You have to wonder just how accurate the 577bhp, 513lb ft official figures are. 0-62mph, meanwhile, is over in 3.6 seconds, although I don’t think we’ve managed that today: the launch control function seems to be struggling to get the car off the line cleanly. The noise of this 4.0-litre engine is something I’ve always struggled with. You’re certainly not left wanting for volume, inside or out, but it’s not an especially nice noise. It’s just…noise. As with every other kind of AMG GT, under all the pops and bangs you’re left with a relatively underwhelming, bassy thrum. It’s a highly effective engine, especially paired to this super-fast and near-faultless seven-speed dual clutch gearbox, but it’s lacking in emotion. Its thumping torque delivery at least makes it more memorable than the 3.8-litre V8 in the McLaren 600LT, at least. Having driven the G63 to the shoot location, it seems fitting to round the day off by driving the GTR back home. One last, thrilling blast up the twisty bit of tarmac we used for cornering shots later, we find ourselves on a dull, lorry-infested A road for the rest of the journey, giving the perfect opportunity to relax and reflect. "There is a place for both cars, and each ends up highlighting what’s special about the other"
The G63 is silly. It doesn’t really serve any purpose, and yet I wouldn’t want to live in a world where it doesn’t exist. I don’t think it’s possible to drive it without smiling, whereas the GTR is a car you drive with a very serious look on your face. The latter is a vehicle that leaves you astonished, rather than amused. There is, of course, a place for both cars, and each ends up highlighting what’s special about the other. 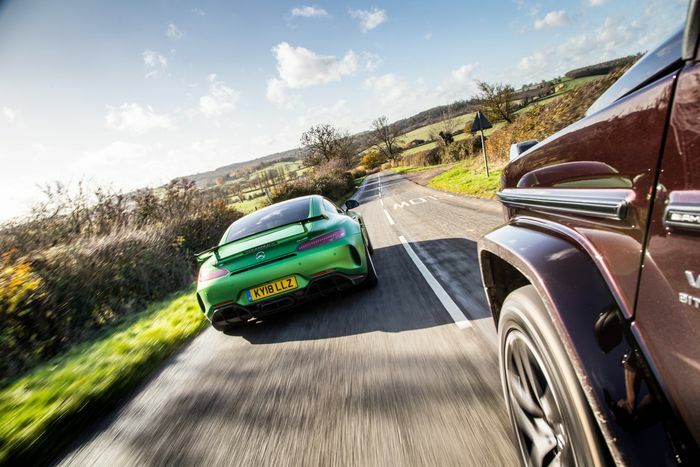 The GTR’s sublime chassis seems all the more impressive after leaning around every corner in the G63, while that big bus’ penchant for tomfoolery is a breath of fresh air after a super-serious drive in the angry track car. But given the option, which would I most want to keep on my driveway full time? With two cars that are so different from one another it’s hard to quantify why, but I found myself reaching for the keys to the GTR more than the G63. Regardless, I love them both to bits.